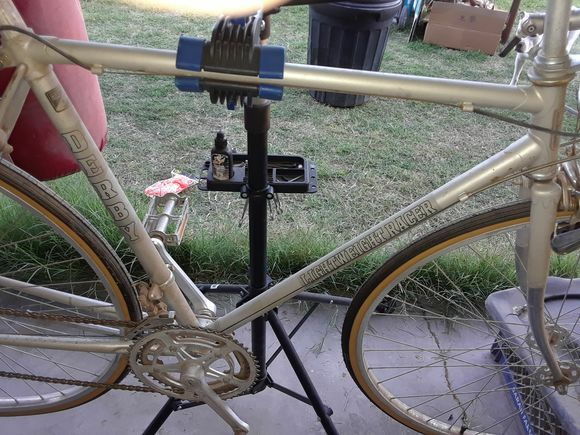 hey guys im new to the bike scene i started this summer with a univega activa sport and crashed and bent my fork so since then i have been building up bikes starting with the univega and thena sain trapper but now i need a new one cuz im getting taller i found a really nice one on craigslist sadly i have no clue what its worth and i cant find any information on it please help. The bar end shifters were originally designed so that sprinters could change gears while in the drops. But, the design quickly found favor in with the touring bikes. IIRC our @T-Mar has written of the Derby badge. 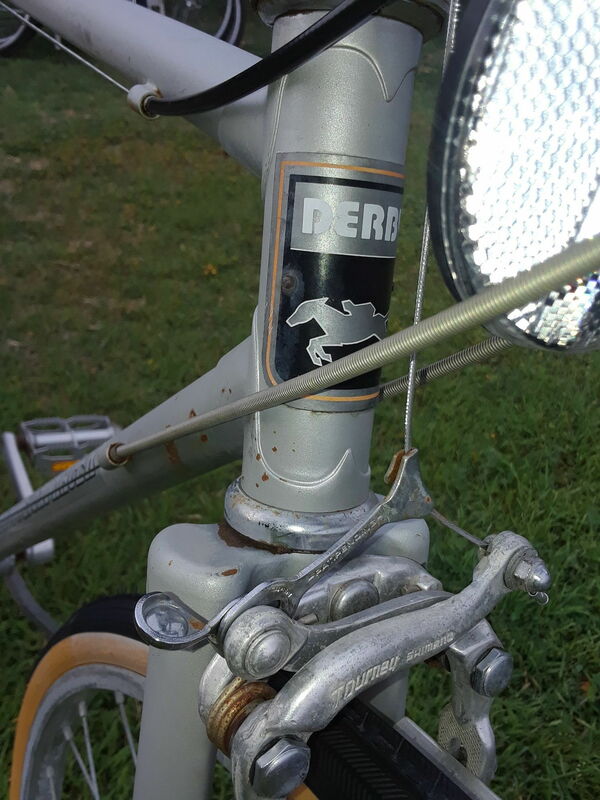 Derby was the bicycle brand of Windsor-Lloyd, a company that appears to have specialized in aftermarket automotive products, primarily lubricants but also fan belts, spark plugs, ignition coils, etc. The company dates back to at least the 1930s with the bicycle brand dating back to at least 1938. I'm not aware of a store chain with which they were associated, so they may have supplied mom & pop type garages. I still have to post a few more times before I am allowed to post pictures. Will post pics when I can. Thanks for the info. Looks Japanese, circa 1975-1977, upper entry level to very low mid-range. Stem is at an unsafe height, well above minimum insertion mark. Please provide picture of tubing decal and serial number. Hi T-Mar I'm new to this forum. How did you get my pictures? I initially tried to post them but was informed that I need 10 posts before I could attach pics. Happy to see them but was surprized. By tubing decal, do you mean the head badge? It does have a decal at the bottom of the seat tube that says "made in Japan". 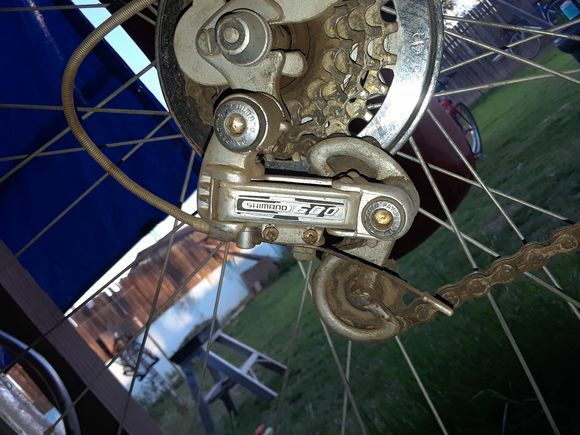 Also, on the handle bars and on the crank arms, it is stamped 79. Could that be the year made. I'll try to post more pictures soon. Thanks. While forum threada won't accept any pictures until 10 posts, any upload attempts are deposited in a picture gallery, which members can access, though it takes a bit of searching. The decal at the top of the seat tube appears to be a tubing decal. 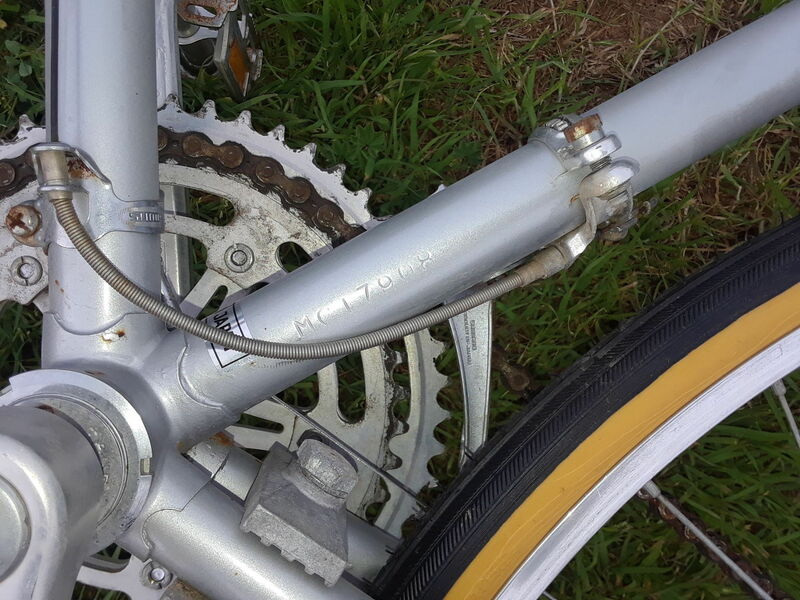 It and the serial number will hopefully reveal more about the bicycle. I was able to take a few more pics, of the tubing decal and the serial number. 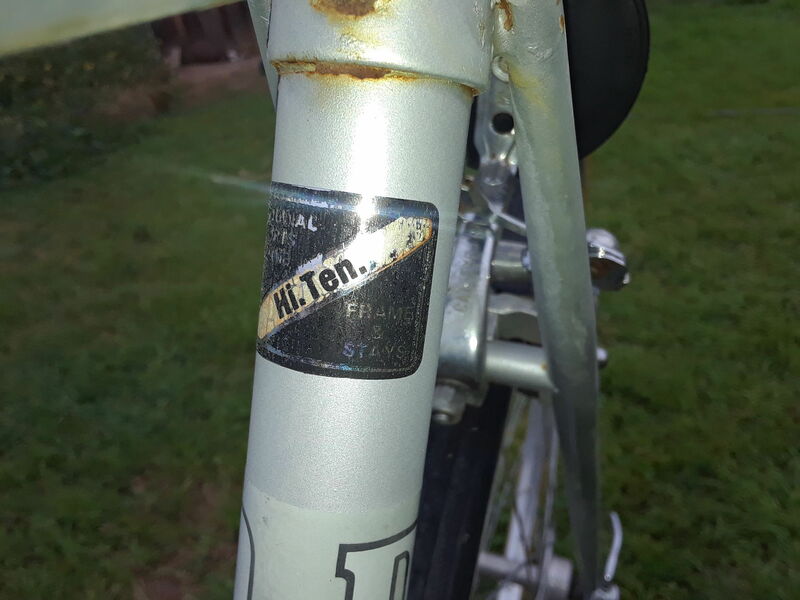 "Hi.Ten" sticker means the frame is made from low grade high-tensile steel. No Reynolds 531 here. Unfortunately, the serial number doesn't supply me with any concrete information as to the exact year or manufacturer. However, the additional picture of the Tourney brakes provides a clue. The yoke cable was eliminated and replaced by the subject link arm for the 1977 model year. These were short lived, not appearing in Shimano's June 1978 catalogue. Of course, it's possible that the manufacturer was utilizing old, left over inventory. 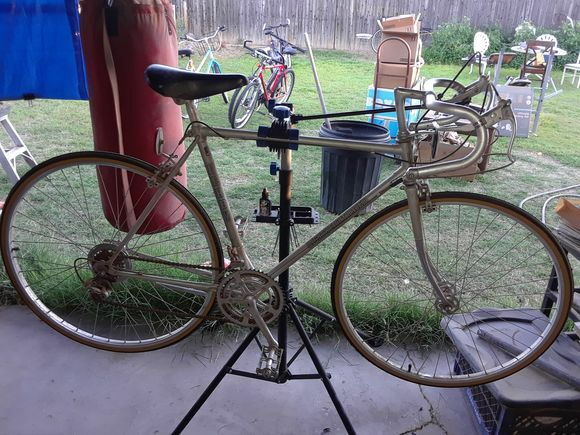 If so, the 79 on the handlebars and in the serial number may have meaning. Either way, it's very late 1970s. As to the level, given the era and hi-tensile frame, I'd consider it upper entry level. Thank-you for posting and taking the extra effort to supply answers to our queries. MCI7908 is a Maruishi date of manufacture code. Not a serial number as indicated previously. The serial number is on the side of the head tube, non-drive side. Those brakes are shot. The instructions explicitly say not to run bare cable in the link arm, and indeed, the brakes don't really work if you do. There's supposed to be a little piece of plastic tubing over the brake cable so when inserted into the linkage the cable doesn't slip, which means finding a piece of plastic tubing just the right size. The brakes work fine. Just need to be cleaned and lubed. The arm is just big enough for the cable to fit, no room for a plastic tube or sleeve. The cable doesn't slide through the arm, it just provides more tension on the cable when the little lever on the left is flipped up to bring the shoes closer to the rim. I am looking at the official Shimano instruction sheet right here in front of me, and it says, and I quote, "NOTE (A) Do not allow the bare inner cable to make contact with the link without the protective tube." It is supposed to be a very tight fit with the plastic tube. It should not be a loose slip fit, it should be difficult to insert and difficult to slide by hand and the link should be compressing the tube.